This is a compulsory theory so everyone learns it and the Examiner will expect you to know it in detail. While the Exam could ask general questions about the theory's ideas or evaluation, it could also ask specific questions, like, How does Agency explain genocide? or, What explanations does Agency Theory give of disobedient schoolboys? or, How can Agency Theory be used to make prisoners more obedient in prisons? 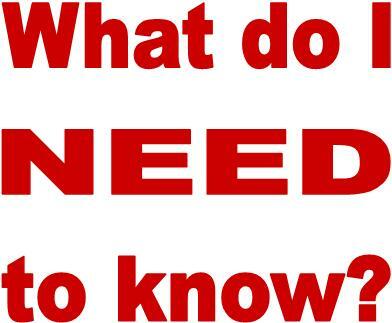 Make sure you can explain the STRENGTHS of this theory as well as the weaknesses. This theory was developed by Stanley Milgram, the American psychologist who carried out the famous Obedience Studies. 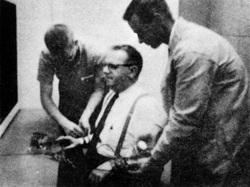 Milgram developed his ideas as a response to Nazi war crimes, especially the trial of Adolf Eichmann. Milgram rejected the dispositional explanations that these crimes occurred because of something particularly brutal or mindless in the German national character. He also rejected realist explanations that the persecution of Jews was some sort of rational response to a perceived enemy. It underlies all Milgram’s obedience studies, several of which are mandatory in the Social Approach. It is a deterministic theory, suggesting people have much less free will than they suppose when it comes to decision-making. 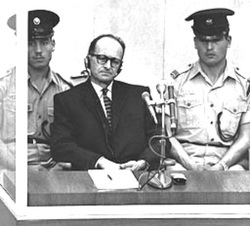 In the early 1960s, former-Nazi Adolf Eichmann was put on trial in Jerusalem for war crimes. Eichmann had been one of the main organisers of the Holocaust but, in his trial, he said he was “only following orders.” Eichmann was executed for his crimes against humanity, but critics supposed this tendency towards blind obedience was part of the German national character. Others disagreed, arguing that there is blind obedience in everyone. This was Milgram’s view and the inspiration for his observational studies. Agentic: In the Agentic State we perceive ourselves to be the agent of someone else’s will; the authority figure commanding us is responsible for what we do so we feel not guilt. We perceive some people to be “authority figures”. These people may carry symbols of authority (like a uniform) or possess status (like rank). An order from an authority figure triggers the agentic shift into the Agentic State. When an authority figure issues an order that goes against our conscience, we experience moral strain. This is because we have two contradictory urges: to obey the authority figure (and society's expectations) and to obey our consciences (and keep our own self-image as "a good person"). Going into the Agentic State removes moral strain, because we regard the authority figure as now being responsible for our actions. This is the appeal of the Agentic State. Milgram has an evolutionary explanation for the Agentic Shift. He argues that obedience is a survival trait that enabled tribes of early humans to flourish. Early humans who were disobedient did not survive the dangers of the prehistoric world and we have not inherited their genes. Even today, society could not function without obedience. However, Nazi Germany was an example of the Agentic Shift backfiring, because people obeyed orders they should have rebelled against. Milgram also thinks conditioning plays a part. From an early age, our parents, neighbours and teachers condition us to respect authority figures. They reward us when we are respectful and punish us when we disobey (operant conditioning). By the time we reach school-age, obedience is deeply ingrained. These two explanations are complementary (they work together). Evolution might have given us a predisposition towards agency but obedience is also strengthened by our upbringing. This is an example of nature and nurture in psychology. Milgram’s famous 1961 study into obedience was the basis for Agency Theory. Milgram observed the participants arrive in an autonomous state, go through the Agentic Shift, experience moral strain and become agents for the authority figure, carrying out acts that went against their conscience. Variation #5 featured a learner with a heart condition. Obedience dropped slightly, but not much. Burger (2009) also found high (70%) levels of obedience when he replicated this. This suggests that empathy doesn’t make people disobedient; it just increases their moral strain, making the Agentic State more tempting. Variation #10 used a run-down office rather than Yale University and obedience dropped to 47.5%. This is also to be expected if the Agentic Shift is triggered by symbols of authority. Other researchers were interested in why some participants disobeyed. Personality might be a factory. Milgram & Elms (1966) studied the original participants and identified an authoritarian personality type that admired rules and was inclined to obey. This personality had already been identified by Theodor Adorno (1950) and linked to Fascist politics and discrimination. Another personality factor is a need to be in control of your own behaviour. The link between a psychological need to be in charge and disobedience to authority was explored in the Contemporary Study by Burger (2009). Milgram developed Agency Theory in the first place to answer the question, Why did decent German citizens obey orders from Nazi rulers to commit genocide? He also addresses a related question, Could something like that happen anywhere? Agency Theory suggests that obedience is a natural human impulse and therefore, yes, obedience to genocidal orders could happen anywhere. There have been cross-cultural variations of the Milgram study. These are important because a tendency to obey authority figures might be something they get from their surrounding culture rather than an innate human impulse (found in everyone, everywhere). Meeus & Raaijmakers (1986) found similar results in liberal Holland to what Milgram found in 1960s America. However, this study used a less distressing punishment (insults, not electric shocks). Thomas Blass (2012) reviewed all these studies and found that, on average, American obedience came out 5% lower than non-American studies. This certainly suggests that genocide could happen anywhere. This makes it very important that countries develop democratic institutions in which authority figures are questioned and challenged. 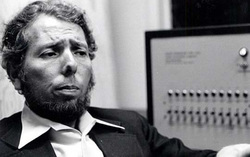 Milgram carried out a lot of research in support of Agency Theory. His “variations” support the idea that situational factors make participants more or less obedience, especially when they relate to the perceived authority of the experimenter. On the other hand, dispositional factors (like empathy or gender) don’t seem to make much difference at all. Later studies (like Burger, 2009) have tended to back up Milgram’s conclusions. All around the world, obedience is high, even when authority figures give orders that are distressing and immoral. Agency Theory also explains events like the Holocaust, the Rwandan genocide and the ethnic cleansings in the Balkans in the ‘90s and in Syria today when these crimes are ordered by authority figures. Moral strain is one of the distinctive features of Agency Theory (it is missing from Social Impact Theory). However it is a problem for the theory. In Milgram’s observational studies, moral strain was shown by the participants who obeyed (weeping, groaning, shaking, fainting), not by the ones who disobeyed. 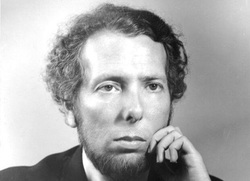 Milgram’s theory suggests that the Agentic State is an escape from moral strain, but this is not what is observed in his studies. Milgram’s research suffers from a lack of ecological validity, since in real life teachers are not asked to electrocute students, nor were wartime Germans asked to do this by the Nazis. The artificial and unusual nature of the supporting research might count against the theory. Meeus & Raaijmakers (1986) replicated Milgram with insults instead of shocks; this is much more realistic but this study still put participants in an unusual position (making them pretend to interview people for a job and deliver insults that appeared on an overhead TV screen). The alternative theory is Social Impact Theory which suggests that everyone applies Social Force to everyone else to get what they want. This is similar to Milgram’s idea of the Agentic State, because people find it hard to resist pressures to obey. Both theories regard people as passive, doing whatever social pressure makes them do. However, Social Impact Theory ignores the importance of moral strain. There are other theories that explain obedience. Theodor Adorno (1950) argues that some people have an “Authoritarian Personality” that is threatened by people who are different and enjoys following rules. This theory that suggests obedience to evil orders comes from a dysfunctional personality, not a social situation. The idea of the Agentic Shift may help reduce prejudice and discrimination because authority figures could tell people to be tolerant and understanding of outsiders. In fact, this is often done, with celebrities and sporting heroes visiting schools to encourage tolerance and equality (as well as telling students not to do drugs or crime). This is one of the reasons why there is such an outcry when a celebrity like a sports star or musician makes a racist remark or behaves in a sexist way: as an authority figure, they may be encouraging their fans to do as they do. Agency Theory also suggests there is always a danger of blind obedience, even from people who have no personal prejudices. To counter this, society tries to hold authority figures to account through democratic processes and “checks and balances” in government, so that no authority figure has too much power. Holocaust Memorial Day (27 January) is celebrated each year because Agency Theory tells us that the Holocaust could happen again, anywhere. Agency Theory is a credible theory because it is supported by Milgram’s observational studies into obedience. (AO1) In these studies, participants obeyed an authority figure by giving electric shocks to a learner. An objection to Agency Theory is the idea of moral strain, which is supposed to go away when people enter an Agentic State. (AO1) Milgram observed distress in the participants who obeyed (like crying and shaking), not the ones who disobeyed, which goes against the theory. A different approach is Social Impact Theory which suggests lots of other pressures that make a person obey besides the authority figure’s status. (AO1) Agency Theory says obeying is automatic but Social Impact says it depends on whether the authority figures outnumber the followers. Agency Theory has a clear application because it says people will obey if teachers surrounded themselves with symbols of authority (such as wearing a uniform and having the flag in their classroom). (AO1) This was backed up by Milgram's Variation #10 who found the participants were more obedient at prestigious Yale University than at a rundown office. Some things about Agency Theory are backed up by evidence but the idea that people can't help obeying isn't so credible and Social Impact Theory is a better explanation of why some disobey. There has been a long running conflict between the two neighbouring countries of Ranzea and Gofani. The president of Ranzea has ordered the invasion of Gofani to take control of the country. There have been reports of soldiers from Ranzea carrying out atrocities in Gofani villages. Agency Theory would explain these events by saying that the President of Ranzea is an authority figures and the soldiers are in an Agentic State. The President probably has symbols of authority, such as appearing on TV in a military uniform with the Ranzean flag behind him. The soldiers see themselves as agents of the President’s will, so they do not take any responsibility for what they do. They view the blame for atrocities as going to the President, not to them. Some soldiers might feel moral strain at carrying out these atrocities, but if they enter an Agentic State this strain will go away. Soldiers with an Authoritarian Personality will take this way out.